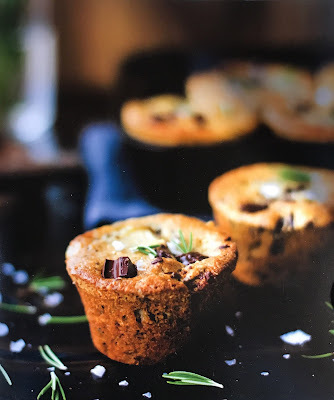 To make the cakes, position a rack in the upper third of the oven and preheat to 175 C . Brush the cups and top of a standard 12 cup muffin tin with the softened butter, or use paper liners. In a large bowl, whisk together the sugar, eggs, yogurt, olive oil and rosemary. Gently stir the flour mixture into the egg mixture until smooth, then fold in the chocolate and pears until evenly distributed. Divide the batter among the muffin cups, filling them almost to the top. Top each cake with a pear piece, chocolate bits, a few bits of rosemary, a dusting of course sugar and a few flakes of salt. 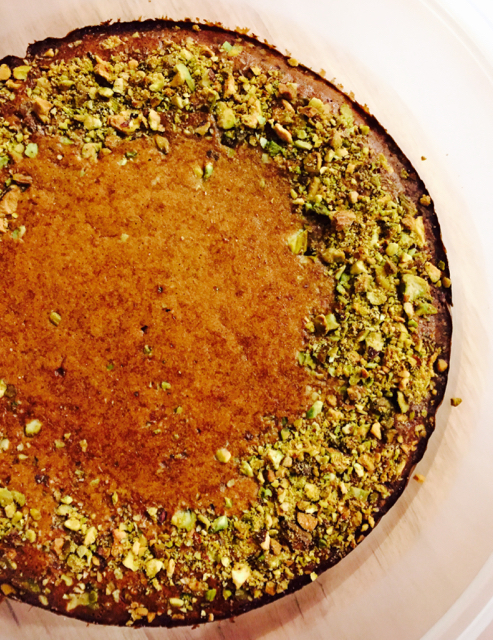 Bake the cakes until golden on top and a toothpick inserted into the centre comes out clean with a few moist crumbs, 23 -30 minutes. They are still baking from residual heat so let them cool until warm, at least 20 minutes, then release then from the pan and let them cool completely. Extra cakes will keep, airtight at room temperature, for up to 3 days. 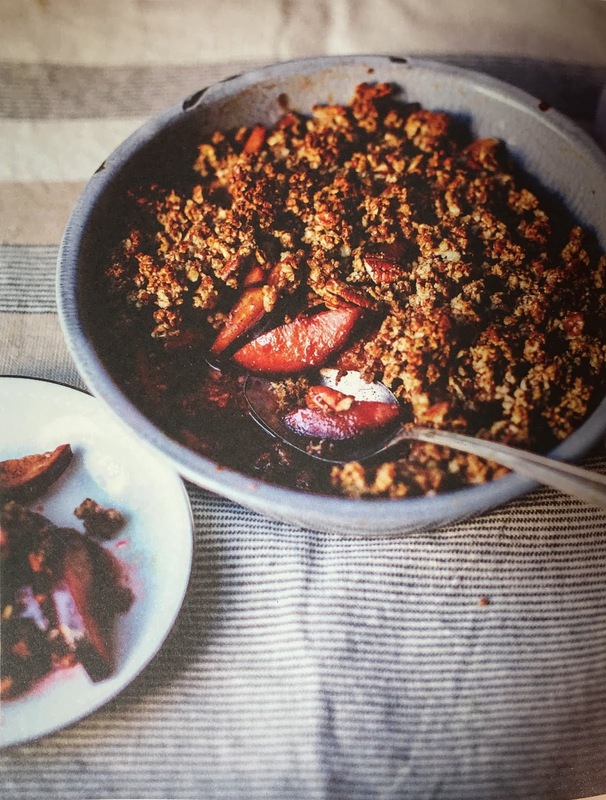 A simple and scrumptious crumble. 2. Make the Filling: In a 20cm oven proof dish add the stone fruit, maple syrup, lemon juice, arrowroot powder, cinnamon and sea salt and lightly toss to combine. Set aside. 3. Make the Crumble Topping: In a food processor, combine the pecans, maple syrup, cinnamon and sea salt. Pulse the mixture until you have a crumbly consistency. 4. Sprinkle the crumble mixture on the top of the stone fruit. 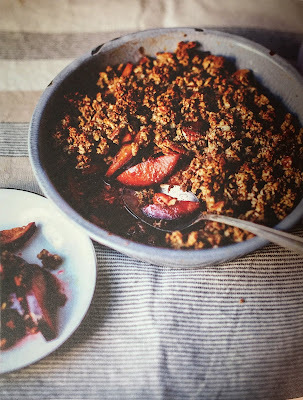 Bake the crumble until the fruit is tender and the topping has browned, 22 to 25 minutes. Serve warm or at room temperature. Slice the cucumbers into rounds about the thickness of a coin. Put into a bowl and sprinkle with the salt, then leave to sit for an hour or two (or overnight). This is to draw out any excess liquid; the bigger the cucumbers, the longer it will take. Transfer to a large colander, rinse and leave to drain thoroughly. Meanwhile, sterilise your jars. I use the dishwasher. Make a brine by putting the vinegar, sugar, turmeric and 500 ml of water into a medium saucepan over low heat. Stir to dissolve the sugar, then increase the heat and bring to the boil. Let it bubble for 5 minutes. When the jars are cool enough to handle, use small tongs or clean hands to carefully pack the cucumbers into the jars, adding 2 or 3 peppercorns to each jar. The jars should be full but not over-packed – the brine needs to cover every slice of cucumber, and if they are packed too tightly the brine won’t be able to get into every nook and cranny. Carefully fill the jars with the hot brine until the cucumbers are completely covered. Remove any air bubbles by gently tapping each jar on the work surface and sliding a butter knife or chopstick around the inside to release any hidden air pockets. You may need to add more brine or cucumbers after doing this (the liquid should reach about 1 cm from the top of the jar). Wipe the rims of the jars with a clean cloth or paper towel and seal. Heat-process then store in a cool, dark place. Although these pickles will keep for up to 12 months, they start to lose their crunch after about 6 months. 1 Preheat oven to 180C. Combine almond meal, sugars. butter and 1tsp salt in a bowl, then rub with fingertips until coarse crumbs form. Spoon half the mixture into a lightly buttered and baking paper lined 26cm- diameter springform pan, gently pressing to evenly cover base. 2. Add egg, yoghurt and nutmeg to remaining crumble mixture and beat with a wooden spoon until smooth and creamy. Pour over prepared base, smooth top, scatter pistachios around edge and bake until golden (30-35 minutes). Cool completely in pan on a wire rack to room temperature, then serve with extra yoghurt. The cake will keep in an airtight container for up to a week. A fabulous and surprising addition to the cheese board or pre dinner drinks, all year round. Cover and boil until the sugar is dissolved; about 5 minutes. 450g whole crab apples with stems / red currants with stems / slightly under ripe cherries with stems (with or without stones). Firm, tart fruit is best. Simmer briefly, until just tender, depending on fruit and ripeness. Do not let them get mushy. Remove from the syrup and place into jars. Boil until thickened a little then pour over the fruit in the jars. Seal. Leave for a month before using. Serve with cheese by removing each piece by the stem. The pickling syrup may be re-used for more pickling or poured over ice cream. Melt butter and sugar, add half the pineapple slices and cook 3 minutes, turning once. Remove and cook the other half. Remove. Reserve syrup. Into the last of the reserved syrup grate a good knob of fresh ginger and heat gently. Drizzle cake tin with 2 Tbl reserved syrup and arrange caramelised pineapple slices, overlapping. Use them all. Doubling up is ok. Keep rest of the syrup for the sauce. Make more if necessary. To beaten butter and sugar, add 2 spoons of the plain flour then gradually add the eggs, beating well between additions. Add a little more flour if it looks like curdling. Stand cake 5 minutes then turn out onto a beautiful serving plate. Heat stock and keep hot. Heat olive oil in a pan and cook onion gently until soft. Add garlic and rice and stir to coat. Add 1 cup at a time of the stock to the rice and stir, on gentle heat, until absorbed before adding more. This will take a good 30 minutes or more. Do not rush it…. Have a glass of wine while you relax and enjoy the process. Meanwhile combine the gremolata ingredients and press onto the fish fillets. Cook the fish in a pan. Flake gently. Gently mix the zucchini and the fish through the risotto and serve with lemon wedges.